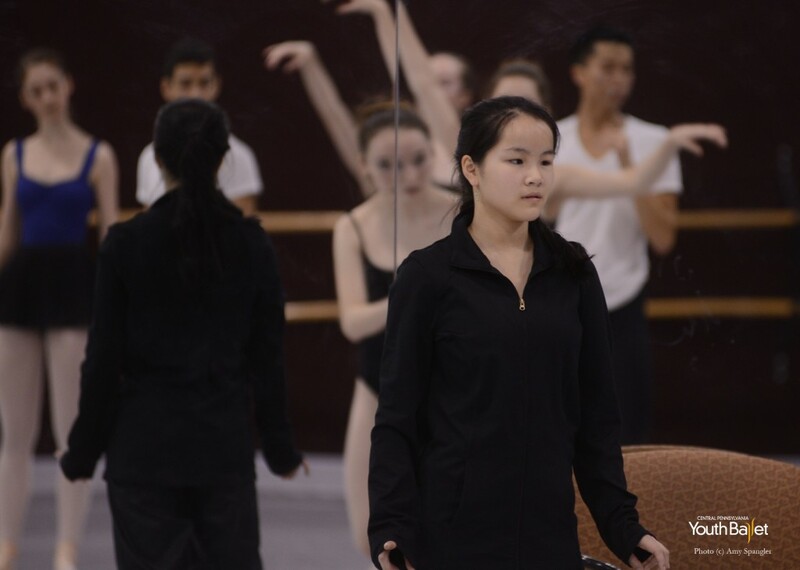 On February 1, Central Pennsylvania Youth Ballet held showings of its FirstSteps choreographic workshop. Four very talented students debuted their creations after working tirelessly in the studios for only eight short days. The process itself included more than just those 25 rehearsal hours. CPYB resident choreographer Alan Hineline led them through choreographic composition classes. Music was selected and analyzed. Some even plotted their ideas, plans and shapes onto paper. The behind-the-scenes prep piqued my interest nearly as much as viewing the final showings. So, I approached one of the first-time firststeppers and asked her to journal her choreographic experiences. In her FirstSteps work, Solis, EmmaRose Atwood succeeded at drawing the entire audience into her imagination. I wanted to hear more about how she got there: emotions coupled with reactions, the wildly creative days, moments of dreaded dry spells, choosing cast and costumes. Join me in perusing EmmaRose’s journal as she navigates through her inaugural choreographic venture. It all started back in November when submissions for FirstSteps were being accepted. I turned mine in, relieved that it was done and on time. I definitely had some anxiety if I was going to get picked or not, but I was excited at the possibility of getting to see an idea of mine come to life! Today was our first composition class. We established what we wanted to show through our choreography and learned how to count and map out our music, so it’s easier to explain to our dancers. It was helpful to see how an experienced choreographer appraises a project and incorporate it into how I begin mine. Second composition class! We got to bring a friend this time. I brought Sarah Clarke and we tried different variations on 16 counts that I had choreographed. The goal was to change up the original version using different methods including repeating, reverse, accent and rhythm. Our first day in the studio! It was really exciting AND productive. I enjoyed my time with all of my dancers. Already very proud of them. Third day of FirstSteps and things went really well. We had a showing at 2:30 where everyone participating in FirstSteps, including CPYB teachers, gathered in Studio 6 to watch what we [choreographers] had accomplished in our 3 days. Everyone’s pieces looked good! Today I finished a section that has been giving me a lot of stress! It feels good to have so much done and the end in sight! I also finished my third section today. Very productive. I went in today with hopes of finishing my finale and second section. But that didn’t happen! I got stuck. Ended up only getting a little done. It is frustrating. It’s stressful to not be able to have ideas flowing, especially since I had come in with the idea that I was most definitely going to finish. I didn’t. I polished and cleaned, so I wouldn’t waste time. I am definitely going to finish tomorrow. Finished my ballet! It felt so good to be able to say that. Everything was coming together! Last day before the shows! We had an hour and a half before a dress rehearsal of our final piece. I picked out my costumes earlier in the day. That part was quite a challenge for me because I couldn’t seem to find anything that was just right. I got so frustrated. Eventually I did find something and it worked out brilliantly! The dress rehearsal went well and it was so cool to see my entire piece the whole way through, with costume and everything! Today was the day! I was definitely going through a mix of anxiety and excitement. People were finally going to see what I had just spent the last month dedicating the majority of my time to. We had a short rehearsal at 11:30. I ran the whole ballet through a couple of times. At 1 p.m. we had a full dress rehearsal of the entire show. Barbara Weisberger, Pennsylvania Ballet founder and Carlisle Project founder, was at the dress rehearsal and the first show. All the choreographers got to talk with her. She gave us advice that was very insightful to what we could do if we pursue this (choreography) as a career. First show. I have to admit I was nervous. I couldn’t wait for people to see what I had done. But I was nervous that things could go wrong. It was great! Obviously there were things to improve upon, but I was so proud of my dancers. Second show I was nervous, too — but I didn’t need to be. To all of the other choreographers, your pieces were beautiful! I am so thankful for this experience. I learned so much and loved working with all of my dancers. I’m so proud of every single one of them!